హ్యుందాయ్ Elite ఐ20 9 వేర్వేరు రంగులలో అందుబాటులో ఉంది - Star Dust, Fiery Red Dual Tone, Fiery Red, Passion Orange, Typhoon Silver, Mariana Blue, Polar White Dual Tone, Polar White, Passion Orange Dual Tone. Interested in buying the Elite i20 facelift? Know which of its variants is the right fit for you. 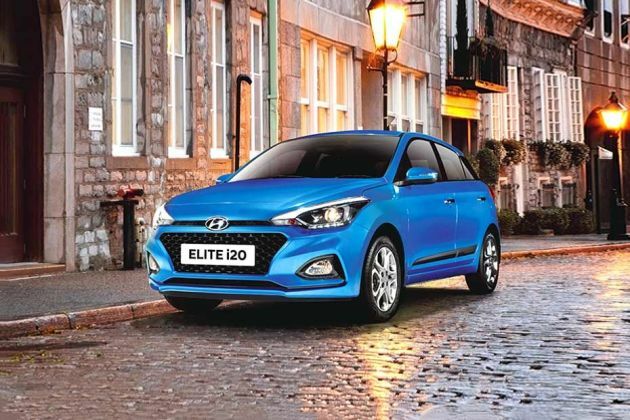 2018 Hyundai Elite i20 - Which Variant To Buy? The same high-class features of an SUV with the great built quality and amazing driving experience. Hyundai i20 is an excellent car. Comfortable, stylish, and beautiful. Hyundai i20 is far better than Maruti Baleno technically and safety wise best hatchback available in this range asta optional has every facility of a luxurious car. Very efficient. I have the Elite i20, 2017 top diesel model. I am very happy with my car and the performance. It is a fabulous car. Who so ever drives it enjoys the powerful drive of the car. And if we talk about its seats then they r very comfortably. Its looks are amazing too. This car is a supercar, its top speed is 240 km/h and nice alloy wheels. My dream car surprises me everyday !! హ్యుందాయ్ ఎలైట్ ఐ 20 / యాక్టివ్ చిన్న నవీకరణలను మరియు ప్రామాణిక డ్యూయల్ ఫ్రంట్ ఎయిర్బ్యాగ్స్ ని పొందనున్నది. J.D. Power Study ప్రకారంఎలీట్ ఐ 20, వెంటో అండ్ XUV50 అనే కంపనీలు చాలా బెస్ట్ డిసైన్స్ కలిగి ఉన్నాయి.